No sooner have we placed the leftover turkey and stuffing in the refrigerator, then we are off searching for the perfect holiday presents, wrapping gifts, and baking treats. The end of the year can be a mix of constant motion laced with plenty of stress triggers to keep us on our toes. This holiday stress may not only affect you but can also impact your elderly loved ones. If you are a caregiver, here is a holistic approach to relieving stress during the holidays—mind, body, and spirit. These stress-reducing tips can work for both you, and your aged loved one. Meditate. Meditation is no longer just for the hippy crowd. Research has found that benefits of this practice can improve longevity, reduce stress, and impact your quality of life. So breathe deep and let those holiday stress triggers melt away. We all know how restorative a good night’s sleep can be for us. For your personal well-being and happiness, especially during these hectic holidays, focus on getting enough sleep to energize you for the next round of holiday cheer. 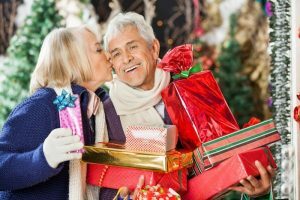 The holidays can be difficult if your loved one has recently lost a spouse. Their grief around the holidays is understandable. Many elderly adults don’t want to burden their children emotionally. If this is the case, suggest that they find someone who they can confide in (priest, therapist, or friend) or write about their feelings in a journal. Walk. Hit the mall, not to holiday shop but to walk. Regular exercise is important for older adults to maintain their mobility and independence- whether inside or outdoors. Many malls are open before the stores and crowds to allow people to walk inside, away from the cold and rain. And an added benefit is you can enjoy the window displays and mall holiday decorations to get you in the spirit of the season. Eat healthy. Overindulging at the holidays is easy. Rich food, too much alcohol, and loads of sugar are a few of the pitfalls of the season. We’re not saying that you can’t enjoy some treats here and there, but try to eat indulgences in moderation. Put down the carrot cake and try a carrot. There is no shortage of uplifting holiday tunes this time of year. Shake off those winter blues with a twirl around the dance floor or while mopping the kitchen floor. No matter your age, dancing can lift your mood. Attend a religious service with your family or celebrate a religious holiday tradition in your home. Religion is an excellent way to connect with your immediate family, extended family, neighbors, and the greater community. Surrounded by family and friends, the holidays are the time of year to reminisce about the past and to create new memories. It is important to share your holiday memories, stories, traditions, and photographs with the next generation. Find humor. Some say that laughter is the best medicine. Enjoy this holiday—relax, smile, and share a laugh. At Aegis Living, we wish you and your family a warm and happy holiday!